Guess which lure will catch the most and biggest bass. Will the new, undamaged one in the middle catch more bass than the other two ? How about the beat up one on the far left? How about the one on the far right? It still looks to be in pretty good shape. If you guessed the one on the far left is still just as good as the other two; you are correct. Actually,all three lures in the pics are the same lure. I make this lure and the name of the lure is Sam's Favorite. I gave it that name because my friend Sam loves it and he has caught many, many bass on this small popper style lure. Sam has made thousands of casts with this lure and has caught hundreds of bass with it and many of them over 4 pounds. The only reason I have the lure today is that the bottom hook hanger finally broke and I am replacing it with a new one. I offered to give Sam a new lure to replace the old beat up one but he declined. Sam has learned something that a lot of fishermen don't know. 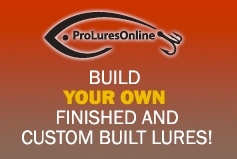 For top water fishing the lure color plays a limited role in your success. It is more about size, shape, sounds, and particularly the action the fisherman imparts to the lure. Since I am not a bass I can't say with absolute certainty, but my guess is that what a bass sees on the surface above him is a dark object silhouetted against the sky. Further evidence that top water lure color makes little difference is how bass will hit top waters like crazy on dark nights. Go figure! There is another thing you might want to think about if you think it is the pretty colors that bass are attracted to on top water lures. Take a look at the high percentage of top water lures that are white on the belly; some are yellow. All the beautiful colors on top water lures that we think are important are where? You guessed it, on the top of the lure where no bass ever sees. I make and paint wooden top water lures and I am much like a lot of other bass fishermen in that we all have our favorite lure color/patterns. The attractive colors I think are more for us fishermen and a hungry bass could care less.They are attracted to the top water lures for reasons other than the pretty colors. Takeaway? 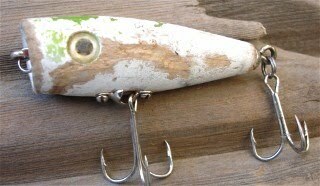 If you have a magic lure that seems to catch bass better than anything you have; don't quit using it just because all the paint is chipped off. Keep casting it just as it is because it is most likely not the pretty color that is attracting those hard hitting strikes.